As we continue this Hardstyle Kettlebell Series for Kettlebell Kings we have built up our strength and proper movement patterns by learning the deadlift squat and swing which are foundational for what we are covering now: The Kettlebell Overhead Press. 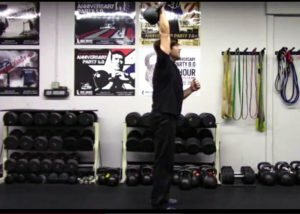 The kettlebell Overhead press, or Military Press, is a grind consisting of high tension and strict technique. This exercises is guaranteed to make your shoulders strong.